"D" system (American Sankey) is the most common system used in the U.S.
How do I know which valve system my keg uses? To see a list of prominent beers and the valve types they utilize, check out our Draft Beer Tap Towers, Faucets, and Components Guide! Tap a keg of your most popular brew with this Micro Matic 7485BB-B coupler! 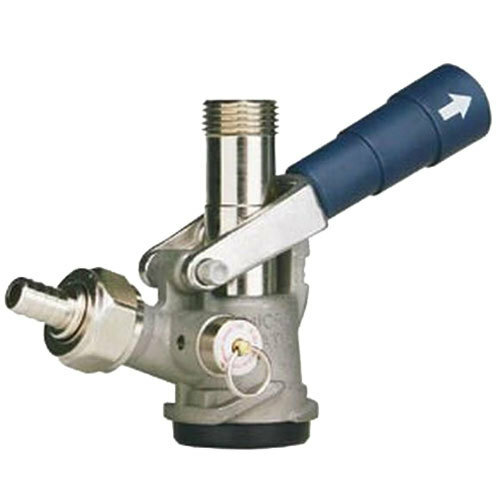 This coupler is compatible with "D" system keg valves, also known as American Sankey, which is the most common system used in the United States. Used by all major breweries including Anheuser-Busch, Miller, Molson-Coors, and Labatt as well as most craft breweries, this unit's compatibility is rivaled only by its durability. It boasts a forged brass body that's sure to last over the long haul and includes a chrome-plated probe that can be used for almost any beer except IPAs. For added safety and peace of mind, this model has an integrated pressure relief valve that stops the gas flow if pressure gets too high (at 55-65 PSI), while the 7/8"-14 beer port thread matches the United States beer industry standard for maximum compatibility.